My friend reminded me that today is the date of the 2013 Chinese Mid-Autumn Festival! One of the tasty hallmarks of this festival are the mooncakes, which are usually filled with sweet red lotus or red bean paste, plus a salted egg yolk tucked away somewhere so that, when you cut into it (and if you're lucky), you may just get a "full moon" studded in your slice! Sweet salty yum. 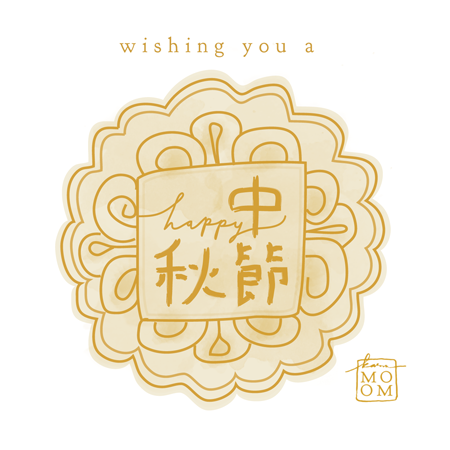 I love the intricate designs that are often molded onto the surface of mooncakes, and tried to incorporate their essence into today's illustration. My handwritten script is just as poor as it was when I was 8 years old, but this time I blame Illustrator for that. If anyone wants to try their hand at a homemade mooncake, here's one nifty & simple recipe. I personally would prefer to buy them from the store in their decorative boxes, though! Interested in reading more about the Mid-Autumn Festival? Try this article on New York mooncake bakeries or this one on the legends behind the festival. thanks * ! mmm ... did you get to eat any yesterday? happy zhong qiou jie! (ping yin phail? :p) this blog is off-the-roof, gurl! thank you miss rita !! ardena, thank you :-) oh, hong kong is near & dear to my heart too -- so glad to meet another mooncake aficionado !